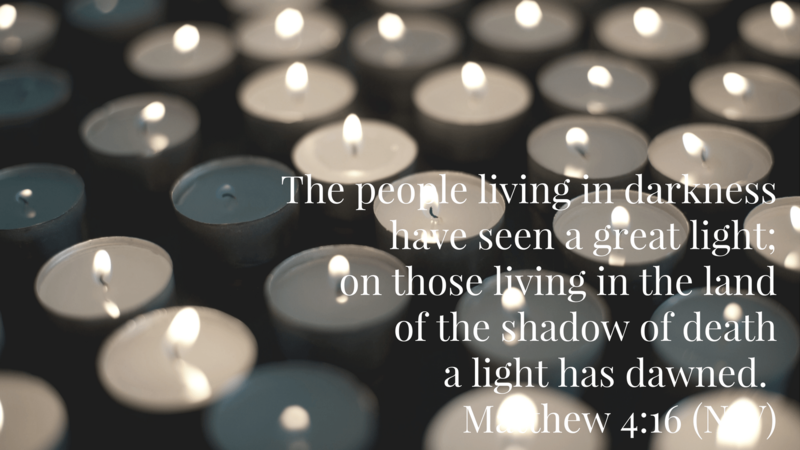 As I have been thinking about Christmas this week, the theme of darkness has stayed with me. It’s not something we like to think about when we think about Christmas, but it is definitely a motif in the unfolding narrative of the nativity. A Christmas tradition is to light candles on an Advent wreath each Sunday of Advent, five candles in all. By progressively lighting candles, the wreath gets brighter. Our anticipation for Christmas also increases. Observing this, I started asking some questions. “Why do we add a candle each week? Why would someone light multiple candles?” The answer that came to me was this, the darker it gets, the more light we need. Today, I found myself needing a bit of light. The most obvious source for me was sharing coffee with a friend. The Christmas season is full of light giving sources and traditions—Scripture, songs, activities, and gatherings. These “candles” offer us a respite from the darkness of shorter days, busy schedules, incessant advertising, and nagging discontent. My prayer for you is that you would find a source of light, embrace its significance for you, and in turn, share it. I don’t think my friend knew he was my candle for today, and I don’t think I will know if I become that for someone else. I do know this, though, if we turn to Jesus, the Light of the World, God’s light of love will shine through us whether we realize it or not. This entry was posted in Uncategorized and tagged Advent, darkness, fellowship, goodness, light, tradition on December 11, 2016 by Brook Fonceca.